The podcast that EQUIPS YOU TO REACH YOUR WORLD. Matt Shaw interviews Christian leaders about missions, evangelism, and leadership. The podcast that EQUIPS YOU TO REACH YOUR WORLD. 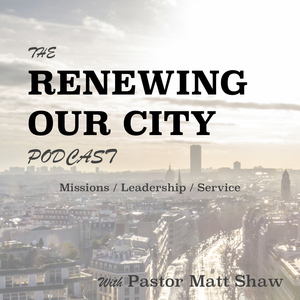 The Renewing Our City Podcast's host, Matt Shaw, interviews effective Christian leaders about missions, evangelism, service, leadership, church planting to help you share Jesus and Serve others in your neighborhood and around the world.